It was not your typical classroom scene in Shannan Pullara’s ninth grade science room at Bruce Randolph School last Thursday. 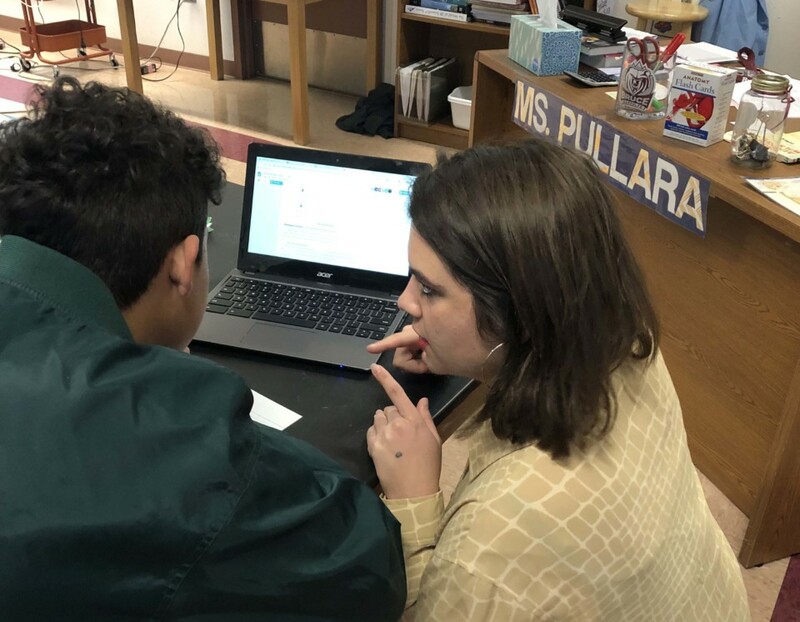 The students were hard at work solving a problem projected onto the board — but instead of raising their hands or turning in answers written on paper, their responses appeared on the screen as they typed in their responses on their individual Chromebook laptops. Bruce Randolph is one of fourteen schools across DPS participating in the pilot of the MyTech program. Funded through the 2016 voter-approved Bond and Mill Levy, MyTech provides every student access to a Chromebook — both in and out of the classroom. The only cost to students is a $20 fee to cover the repair and service of their device. The program is a part of the district’s one-to-one strategy — ensuring every student has access to his or her own device — and its ongoing effort to use technology to enhance and support learning. In her second year of implementing the MyTech program, Principal Melissa Boyd said she already sees a big difference. The program goes beyond just putting a Chromebook into each student’s hands. MyTech schools are each assigned a digital coach — funded through the 2016 Mill Levy measure — who work with teachers to maximize the instructional power of the technology. At Bruce Randolph, Digital Coach Erin Kimmel sees one-to-one access as a true game changer in teaching and learning. Part of what makes the MyTech pilot unique is that students are encouraged to take their Chromebooks home — every day. For many students at Bruce Randolph and other MyTech schools, bringing the devices home means that the entire family can benefit from increased access to technology. Siblings can use them to type their own papers and parents or guardians can apply for jobs or access information via the WiFi hotspot that students can take home with the Chromebook. For students — and their families — the MyTech program offers more than just a computer. It opens a gateway to knowledge, learning and opportunity. With over 9,000 Chromebooks distributed across the district, the MyTech program is helping DPS bridge the digital divide, one student at a time. Learn more about the MyTech program and the 2016 Bond and Mill Levy at bond.dpsk12.org.